Among in all 43 surveyed organizations, the amount raised online was reported to be 15 percent of the total amount received in philanthropic support. The share online was not significantly different for those whose total results increased, vs. those whose total results were the same or lower. The individual responding believes that donors are becoming more familiar with online transactions. Increases in online giving supported growth in total charitable revenue. 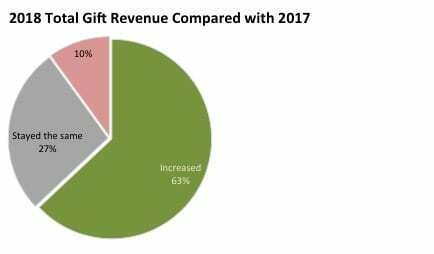 Of the 19 organizations that had increased total funds raised in 2018, 11 (57%) also reported higher online giving. 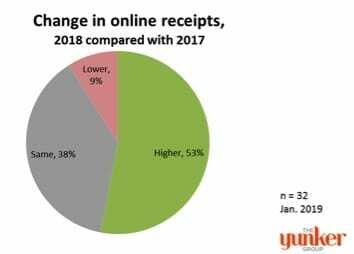 Among the three (16%) organizations that saw increased total revenue but did not increase online receipts, explanations included: “in a campaign” and “last year, sponsors paid online but this year they didn’t.” The third mentioned lack of trust in technology among the population served by the organization (seniors). On average, organizations in this quick poll use 2 different methods of outreach to promote or seek gifts via online portals. One uses as many as five methods. 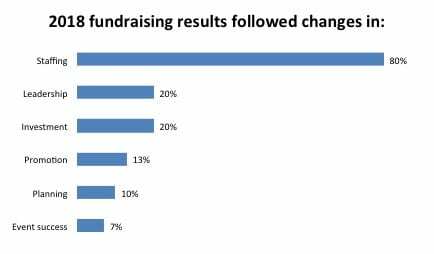 There is no clear relationship between how many methods a charitable organization uses and the direction of change in results for online giving in 2018. 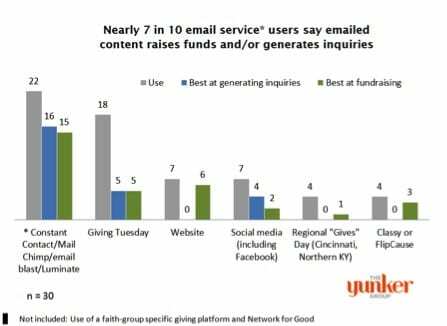 Methods used include eblasts from Constant Contact, Mail Chimp, Luminate or another product; social media including Facebook; the entity’s own website; printed materials such as newsletters; and organized “Give” days whether Giving Tuesday, Cincinnati Gives, or Kentucky Gives. This result is not statistically significant. It might be due to chance, to lower “starting points” for online gift amounts received in 2017, or other factors. Nonetheless, two-thirds of surveyed organizations that raise less than $1 million in a year reported growth in online giving in 2018; compared with 41 percent of the organizations raising $1 million or more. N = 15 in the group with philanthropic revenues of less than $1 million and 17 for the group with revenues of $1 million or more. Among the organizations raising more, a majority (53%) reported online giving the same as in 2017.